﻿This page contains all the latest news and updates on the school GAA team. 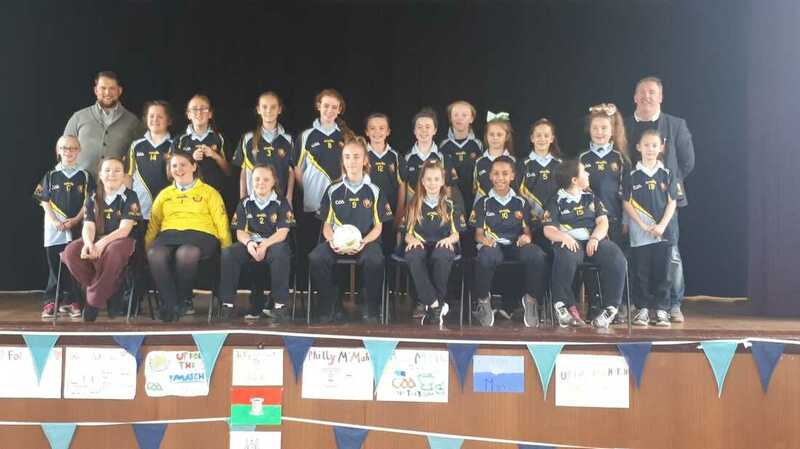 Virgin Mary Girl's have battled their way to the Final in Croke Park on Tuesday 23rd of October. The girls won again today to reach this years Cumann na mBunscol, Sciath Neasáin Quarter Final. The game played at Fairview park against St. Vincent's GNS took place on mild but dull afternoon. The girls got off to a great start with Abbey scoring a super point with the outside of her boot. The girls in midfield worked hard from start to finish, as plenty of possession created scoring opportunities. The half forward line in particular of Abbey, Keisha, and Allysia, who was captain for the day, lead the attack. Courtney was unlucky to get cought overcarrying as she was getting away from the defender to get a goal. The scores continued as the half back line dealt with any attack from the opposition. The determination and teamwork was excellent and the full back line had a quiet afternoon. IN the second half the passing improved and the use of kickpassing into the full-forward improved. Again the half back line held firm time and time again. The trio of Emily, Amalia and Shannon have really built a strong unit in this area of the pitch. Shannon time and time again fighting for th ball in the air, on the ground and setting up many attacks with her pacey runs. The win means we are one game away from the final in Croke Park. Our semi final will be fixed for next week. Well done to the girls, we are so proud of their determination to improve. Laoch an Cluiche: Shannon Murnane. Team: Morgan, Katie, Mia, Amy, Amalia, Emily, Alicia (0-1), Suzie (2-1), Keisha (0-1), Abbey (2-1), Allysia(1-0)Capt, Issabella, Courtney, Lucy. Kayla, Niamh, Chloe, Brooke D.
FIrst WIN FOR THE VIRGIN MARY TEAM!!!!! ​The girls won their first game against GS Barra. The game took place at home at Setanta GAA club's ground. The girls scored straight away after winning the throw in, and with Alicia and Suzie dominating in midfield, the possession quickly turned into scores as some well taken goals and points began to add up. Morgan was solid in goal and her well taken kickouts gave the girls a platform to attack from. Some excellent tackling by Katie, Amalia and Amy along with two superb blocks by Mia and Emily, saved us conceding certain goals. Shannon and Emily began attacking as they carried the ball up field out of the backs. The link up play and slick handpassing gave us lots of options going forward and resulted in many more girls getting on the scoreboard. This win means we now have a quarter final. Final score: Virgin Mary 7-10, GS Barra 1-5. ​Virgin Mary team: Morgan, Brooke D, Mia, Amy, Amalia, Emily, Shannon, Alicia (0-1), Suzie (3-6), Keisha(2-1), Abbey (2-1), Allysia, Courtney, Kayla (0-1), Lucy. 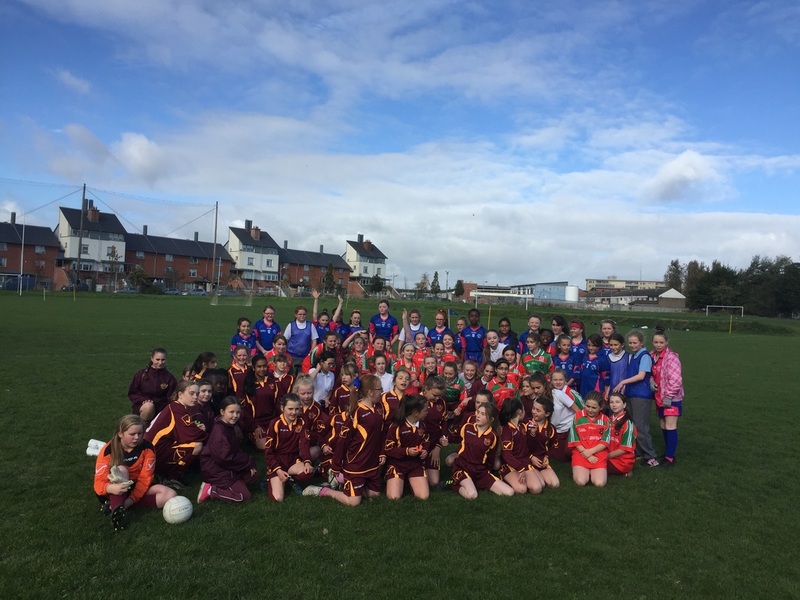 Isabella, Precious, Caitlin, Julia, Kornjelia, Chloe, Brooke C.
Virgin Mary GNS played their second match against Gael Scoil Cholmcille. A fast paced game with all the skills on show from both sides gave the teachers, parents and supporters an entertaining game. Our girls battled from start to finish and some well taken scores, exellent shadowing in defence kept them in the game. 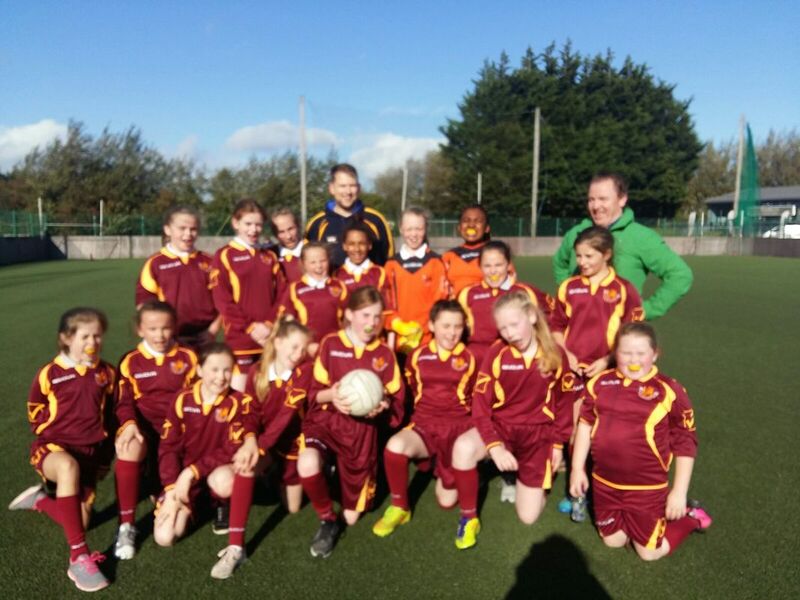 Scores came from Abbey, Keisha, and Suzie who was our Laochra Cluiche with a superb performance from midfield. However GS Cholmcille got the better in the second half in terms of the score board. Two games in , the first win for our girls will come soon. Final score: GS Cholmcille 5 goals and 8 points, Virgin Mary 3 goals and 7 points. Virgin Mary team: Morgan, Brooke D, Mia, Amy, Katie, Emily (Capt), Shannon, Alicia, Suzie (1-4), Keisha (1-1), Allysia, Niamh, Abbey (1-2,) Kayla. Chloe, Brooke C, Marie L, Courtney, Issabella. Season 2018-2019 starts with well matched battle against St. John of Gods. The Virgin Mary Senior football team started their season with a tough match against St John of Gods. The new look team with debutantes Chloe, Precious, Isabella and Katie started the season with a well played narrow loss. They got off to a slow start but rallied and bossed the second half. Scores from Abbey(2 goals) and Suzie(1 goal and 2 points) helped make it a close match. Keisha covered every acre of the pitch in a player of the match performance. Laochra an Cluiche: keisha. Virgin Mary Team: Morgan, Emily, Allyisa, katie, Mia, Keisha, Alica, Suzie (Capt), Shannon, Amy, Issabella, Kayla, Niamh. Precious, Chloe, Courtney. Virgin Mary girls headed to Corduff Sports centre in Blanchardstown in what proved to be the final game of this years Cumann na mBunscol. The game started evenly with both teams working the ball down the field but not finding the target. A reshuffled defence took time to settle and playing into a strong wind, the girls found it difficult to pass the ball forward. St Patrick's girls began to dominate in possession and scored 1-4 without reply. The return of Aoife D to the forwards saw Virgin Mary get their first chance but the ball came off the crossbar and was cleared. The teamwork of Suzie, Shauna and Alicia L created another chance for Aoife who fisted over the bar but the wind took it away. At the other end, had it not been for great taclking and blocking by Brooke, Alicia C, Allysia and a superb performance by Shannon, the scoreboard would have stretched even further in favour of the St Patricks girls. A goal that was ruled wide later in the game also meant that our girls had alot of catching up to do.... And they did just that. It really was a game of two halves though as the half time rally saw Virgin Mary begin to dominate possession and some fantiastic play from Kacey, clever kickouts from Abbey to Shauna and the free winning ability of Sophie who switched to midfield gave Virgin Mary scoring opportunities. These were taken by Aoife who scored three points (one free), Shauna who scored 2, and Kacey who scored 1. The efforts of Melanie, Niamh, Lauren and Amy saw them get more ball possession than ever before and had a goal come for Virgin Mary arrived to Courtney who was unlucky not to get a few attempts, the Virgin Mary team could have won this game. This was definately our closest game to date and both teachers and parents at the game were very proud of the girls today! Virgin Mary team: Abbey, Brooke, Alicia C, Shannon, Allysia, Suzie, Amy, Alicia L, Shauna, Lauren, Emily, Niamh, Courtney, Sophie, Aoife, Melanie, Kacey. Laoch an Cluiche: Aoife D.
Cumann na mBunscol 2017 Round 2. 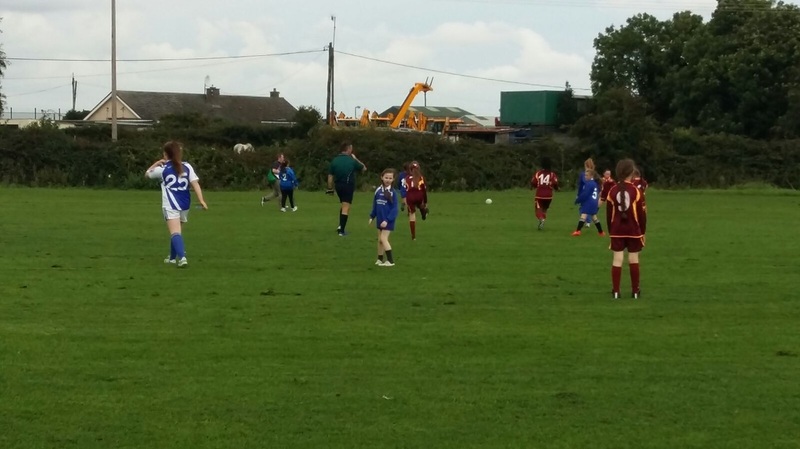 The Virgin Mary team travelled to take on a strong Gael Scoil Choilmcille team in the second match of the 2017/2018 season. A fast paced game saw possession swap between the sides for the first few minutes with no team on top in a balanced first half. The Virgin Mary team missing key 6th class players. The home team were first off the mark with a point from play following brave defending from Alicia C. This was Alicia C.'s first game and she was to put in a trojan effort at full back. This allowed Suzie to move to centre back and the freedom allowed her to make several runs forward carrying the ball into the other half looking for an equalising score. Unfortunately this didn't come in the first half and even though Virgin Mary started to dominate possession, the ball into forwards, Nicole, Lauren and Amy (also her first game) could have been better. Alicia L was unlucky to see her shot go wide after good build up play from Suzie, Shauna and Keisha. Kacey was also unlucky to get dispossed as she was about to shoot towards the end of the half. Nicole also was unlucky after winning the ball and turning before been tackled as she was about to shoot. The second half started the brighter for the Virgin Mary team and they got their first point from play. Halftime sub Niamh and also Ragan made some great tackles and along with Allyisa and Shannon, the defence started to get to grips with the game. Abbey put in another stormer in goal and the work rate of Emily and Keisha on the half forward line was immense. Brooke and Kacey linked up well, the sisters creating a chance for Suzie who hit an unlucky wide. On the kickout a long shot was unluckily deflected into our own net and this brought the scoreboard back to life as the red and white of the Gael Scoil started to find their points. ​This was answered by an interception on the halfway line by Ragan who fed the ball to Suzie, she picked out Nicole and the ball came back out to Alicia L who was fouled. Alicia L was quick to take the free and scored a cracker of a goal from almost the halfway line. Special mention to Kayla R who was unlucky to leave the pitch due to an ankle injury but Melanie was on hand to take her place. 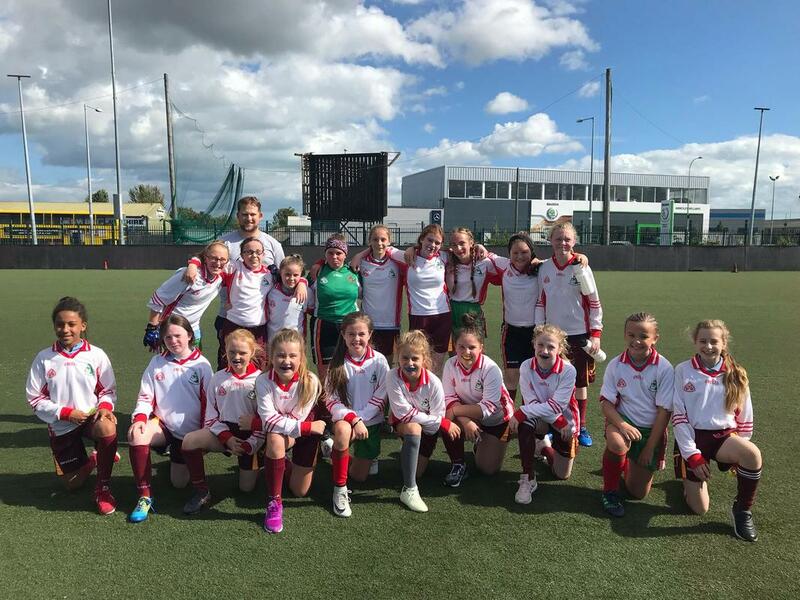 In the end, the Virgin Mary team began to tire and some great scores and a lucky goal left the scoreboard at GS Choilmcille 4-06 to Virgin Mary 1-1. This score was not a true reflection of the game and our girls showed great courage and heart playing their second game this year. More work on turning wides into scores will help things for the next day out. Virgin Mary Team: Abbey, Brooke, Alicia C, Ragan, Shannon, Suzie, Allysia, Shauna, Alicia L, Emily, Keisha, Kacey, Amy, Lauren, Nicole, Kayla, Melanie, Lauren. Cumann na mBunscol 2017 Round 1. The Virgin Mary girls took to Setanta GAA pitch on a wet afternoon with tricky underfoot conditions. The first game of the season was always going to be a tough game as a number of last years team have departed the school having graduated from 6th class. Never the less, the girls put in a spirited performance and showed that in only their second year, they are improving as a team and as individual footballers. The game started with the Home side winning possession and working the ball down the field to Keisha who was unlucky not to pull away from her defender. This early danger to the visitors goal brought energy to their performance as they began to grip control of the game and of the ball. Several times, the Virgin Mary defence was under pressure and goalkeeper Abbey R found herself under fire as the more experienced Holy Child team took shot after shot. Indeed Abbey pulled off a number of saves and with Suzie putting in a big performance at full back, ensured the game did not go out of reach by half time. After the half time meeting, the girls showed more organisation and determination to not only defend but carry the ball forward on numerous occasions. 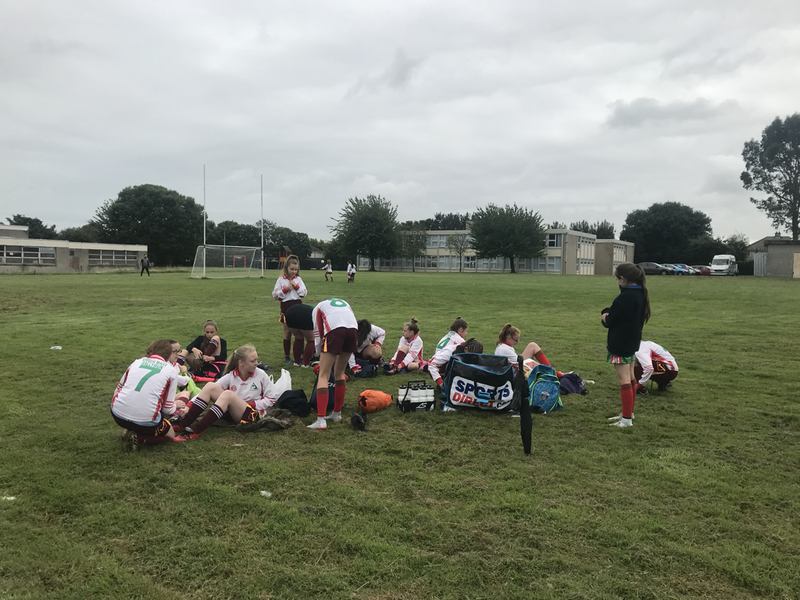 Several times, skilled attacking and pacy runs from Aoife D, Shauna Sp and Marguerita M showed that working the ball in numbers could provide chances of scores. Alicia L got to grips with her midfield role and along with Emily M and Shanika M, started to turn over some of the Holy Child team attacks.Sophie and kacey were unlucky getting caught in the tackle when the goal was available. 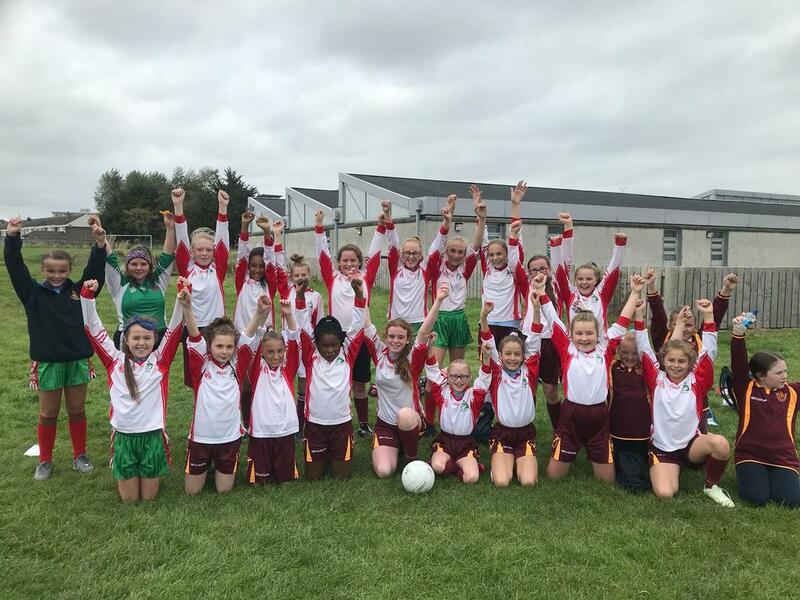 However it was clear for all to see that the Holy Child team have been playing together a while and their success in the finals in Croke Park in previous years told, as they found the net way too easily due to the Virgin Mary team pushing forward looking for their own scores. In the end, the Virgin Mary wide tally of 12 wides showed that scores were hard to find and this is something to work on for the next day. 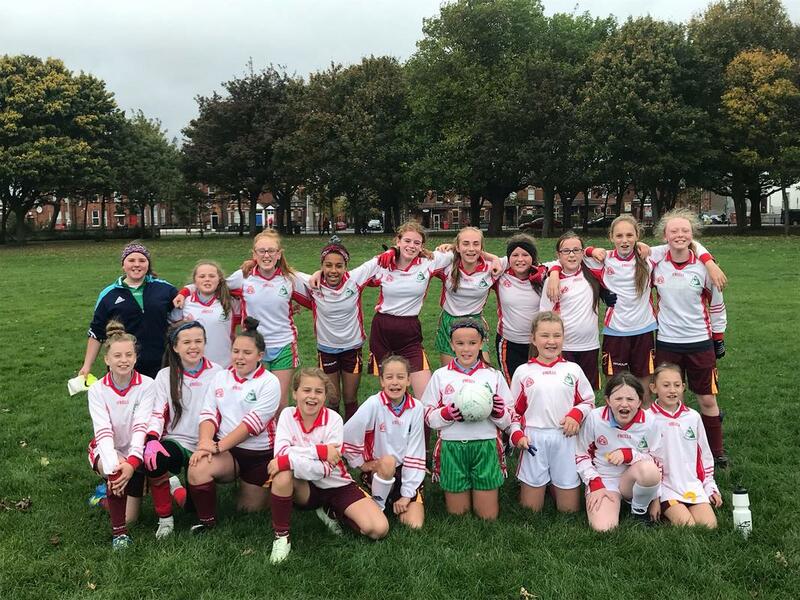 A special mention to Abbey, Courtney, Niamh T, Emily M, and our soul 4th class member Lauren who all made their first appearance in the maroon and yellow for the Gaelic team. 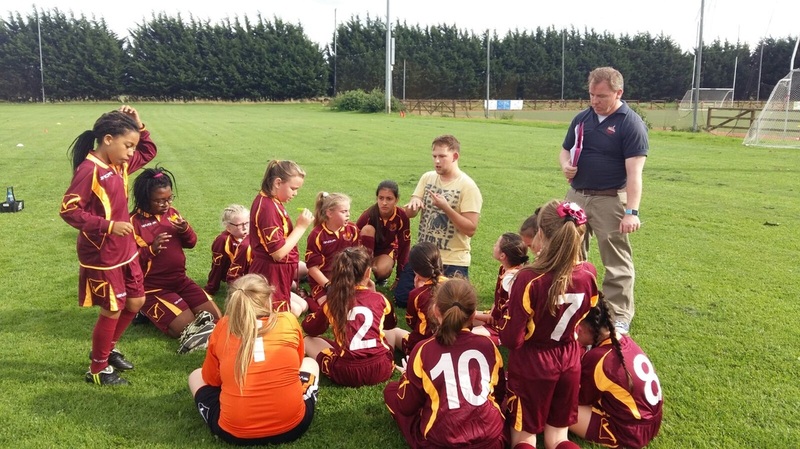 Laoch na himeratha: Shauna S.
The Virgin Mary Girls football team took part in a blitz today against local rivals Our Lady of Victories and Holy Spirit. The local teams were blessed with a cold but bright day with the pitches of Setanta GAA club in great condition. The Virgin Mary Girls were slow to start as the found themselves with plenty of possession something that they hadn't been used to. The team quickly got comfortable with their dominance in midfield and fed plenty of ball into what became a free scoring forward panel. Standards didn't drop as the replacements continued to dominate in all positions. The second game saw a few changes in position but the quality ball into the forwards continued with plenty of scores. The backs had very little to deal with but did snuff out any chances that did make their way into our half. The final game was a much closer affair with the girls trading point for point with the opposition. A disallowed goal kept Virgin Marys in the game and then a superb side line kick by Marguerita put Virgin Marys into the lead. Though Holy Spirit managed to equalize with the last kick of the game it was a fair result for two well matched teams. The performance by the team as a whole made it very hard to single out any one player as the girls played as a well trained unit. Some notable performances were Lauren who marshaled the backs well and kept them focused through all three games. Marguerita M who ran hard and moved into top scorer with a huge variety of well taken goals and points. Kayla R also found a niche in half forward tirelessly getting on the end of a lot of balls and providing possession to the forwards. 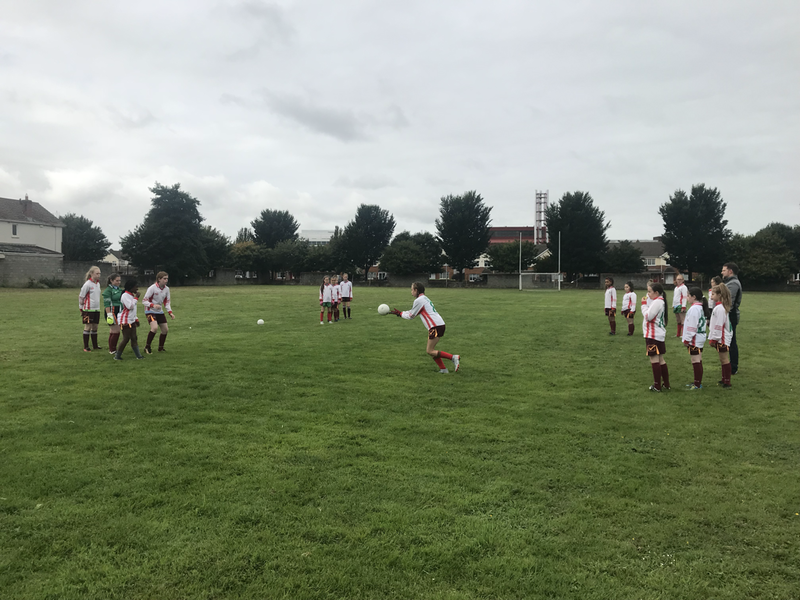 The Gaelic Football team took to the pitches of Setanta GAA club to face strong local rivals ​Scoil an Tseachtar Laoch. In their second only match the Virgin Mary Girls team managed to keep their experienced rivals scoreless for much of the first half. The defence was worked very hard with Morgan in goals doing a superb job and some vital blocks put in by Christina. ​Although the opposition managed to finish a few scores ahead the teams spirit never dropped and every player gave their most until the final whistle. It was another very enjoyable game for the Virgin Mary Girls Football team with all players getting a run out. We look forward to our next game. The football team took to the pitch on a lovely warm September 15th for their first competitive game. They started slowly but gradually took control of the first half and went in at half-time deservedly one point up. The heat and tiredness took its toll in the second half as the opposition netted two goals and two points in a ten minute spell of dominance. The Virgin Mary team rallied though and once again took control for the last few minutes. All the effort did not produce the results on the scoreboard they deserved as possession was not turned into scores. It was a great performance from all the players on their first time playing together but the win will have to wait. The final score was 0-1 to 2-2. There are training sessions after school on Mondays and matches most weeks in September and October. Training is open to all pupils from 4th to 6th class. If you haven't come along yet it's not too late. Contact Mr. McGuinness, Mr. O'Donovan or keep an eye out here or school notice boards for training times. This is the second year that the school has put together a team to enter in competition. We are hopeful that we can get as many players playing as possible to introduce the students to the fun world of the GAA.